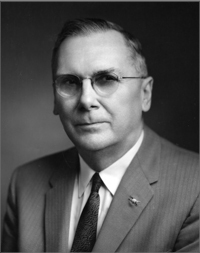 Hugh L. Dryden was Deputy Administrator of the National Aeronautics and Space Administration (1958-1965). Other affiliations included the National Advisory Committee for Aeronautics and the National Bureau of Standards. His research interests included aircraft aerodynamics and supersonic flight. July 2, 1889Birth, Pocomoke City (Md.). 1916Obtained AB, Johns Hopkins University, Baltimore (Md.). 1918Obtained AM, Johns Hopkins University, Baltimore (Md.). 1918 – 1947Laboratory Assistant (1918-1920); Chief, Aerodynamics Section (1920-1934); Chief, Mechanics and Sound Division (1934-1946); and Associate Director (1946-1947), National Bureau of Standards, Gaithersburg (Md.). 1919Obtained PhD in Physics, Johns Hopkins University. 1941 – 1945Chief, Bureau of Ordnance Experimental Unit, United States Navy. 1947 – 1958Director (1947-1949) and Aeronautics Research and Director (1949-1958), National Advisory Committee for Aeronautics, Washington (D.C.). 1951 – 1956Member, Science Advisory Committee, United States Office of Defense Mobilization. 1958 – 1965Deputy Administrator, National Aeronautics and Space Administration (NASA). 1965Awarded National Medal of Science. December 2, 1965Death, Washington (D.C.). Conducted research together in aerodynamics at the National Bureau of Standards. Both employed at the National Aeronautics and Space Administration (NASA). Both worked United States Office of Defense Mobilization. Director, Aeronautics Research and Director. Laboratory Assistant; Chief, Aerodynamics Section; Chief, Mechanics and Sound Division; and Associate Director. Chief, Bureau of Ordnance Experimental Unit. Obtained AB, AM, and PhD in 1919 (Physics). Hugh L. Dryden papers, 1908-1966. The Hugh L. Dryden papers, 1898-1965 : a preliminary catalogue of the basic collection / compiled and edited by Richard K. Smith. Gregor Wentzel autobiographical letter to Hugh Dryden, 1959. National Institute of Standards and Technology records, 1930-1978. Office of the Special Assistant to the President for Science and Technology records of James R. Killian and George B. Kistiakowsky, 1957-1961. Hydrodynamics [by] Hugh L. Dryden, Francis D. Murnaghan [and] H. Bateman. Hugh L. Dryden Physics Today obituary.